2014 was another great year for Lonesome Dove Outfitters. After the heavy snowfall winters of 2012 (Snowpocalypse) and 2013, we were given quite the reprieve in 2014. January saw temperatures in the 50’s, and we had 47 inches of rainfall by the 24th of the month. The snow that was around was reduced to ice, and it made getting around anywhere very difficult. My snowmachine never left the warehouse. Bears were seen wandering the high country in February, and we didn’t really get much snowfall accumulation. 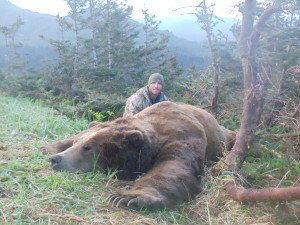 Spring bear hunting was very good and we took 3 bears with skulls over 27”. Jeff Ware’s was the biggest at 28.75” and should make all time Boone and Crockett. 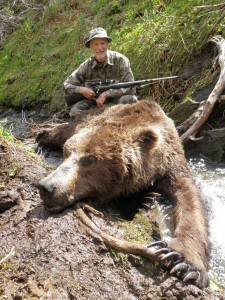 Hunting tactics were a little different as the bears really did not come down and hit the streams and beaches like usual. They had plenty of grass up high when they emerged, and every one we took was on top of a mountain. Black bears seemed somewhat scarce compared to past springs, but I think they were just more scattered because of the lack of snowfall. I once again had the opportunity to participate in a Chugach Mountains Sheep hunt when my good friend Justin from Colorado drew one of the coveted tags. 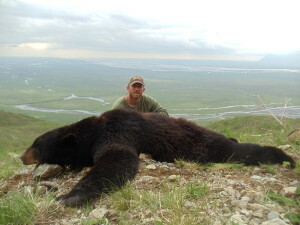 He and Todd came up and we hunted the same country I used to hunt 10 years ago. We saw plenty of rams, but it seems that the harsh winters of 2012 and 2013 had taken out many of the old ones, and we couldn’t find the 40” that we were hoping for. Still, Justin took a very nice sheep, and I was reminded how good sheep ribs taste cooked over a fire. 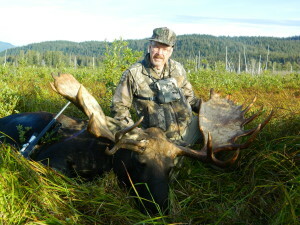 Bear and moose season opened to nice weather on September 1 with only 1 hunter drawing the moose tag for our area. 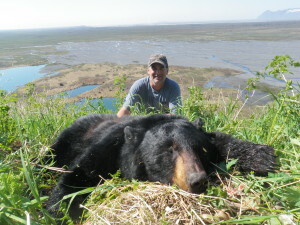 Paul Fabian took a 62.5” bull on the second day of the hunt, but the bears were scattered and opportunities limited. Nathaniel Hilton did miss a shot at a nice wolf, and we saw tracks everywhere we went. 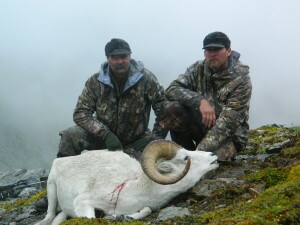 We had 2 early Mountain Goat hunters near our moose area, and Steve Andrade and Dean Brown both took very nice Billies on the first day. 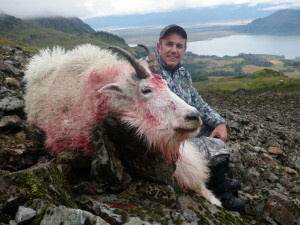 Our regular Goat season opened on September 15 to torrential rainfall and miserable conditions. 3 archery hunters had missed opportunities and Bart Byrd did take one with a rifle, but it was very challenging. The weather cleared as soon as their hunt was over, and we were 100% for the balance of the season, taking some very nice Billies. With the mild winter, the kid survival rate looked very good and the Mountain Goat population seems to be increasing across the Sound. 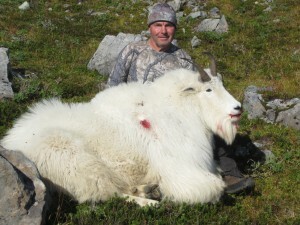 Paul Bernard and Robert Rogan both published stories of their 2013 Mountain Goat hunts with us in North American Hunter and Eastman’s Sporting Journal respectively, so you might read them if you get the chance. 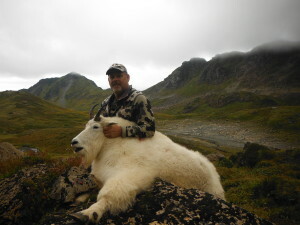 We have 2 Mountain Goat hunts available for 2015, but are full for both our spring and fall bear hunts. There is more availability for 2016, and we promise to provide the same professional service we have always aspired to. We have the same hard working crew, and like fine wine, they just get better with age! Contact us for a reference list or to answer any questions you may have. In closing, I would like to mention that I was fortunate enough to be able to participate in 3 elk hunts in Colorado after our Alaska season was over. I hunted the first one with good friend, Skip Mallory from Cordova, and we hunted for 9 days after scouting for 2. Most of the hunt we slept on the ground and ate Mountain House with water boiled on a fire, something you could never do in Cordova. We saw elk every day, but it was difficult to connect. I finally got a bull on the morning of the last day after 80+ elk moved into our area overnight. On the second hunt, I helped another friend take a bull on the 8th day of a 9 day hunt, taking 2 days to pack it out. Finally, I took my stepsons, Davis and Jacob into the same area to try to fill their cow tags for the 4th season. The weather changed from 65 degrees the previous week to -16 degrees and 14’ of snow. Starting a diesel pickup at 10,000 ft in those conditions proved to be very challenging without a block heater. We covered a lot of ground for 4 days, seeing very few elk or tracks. 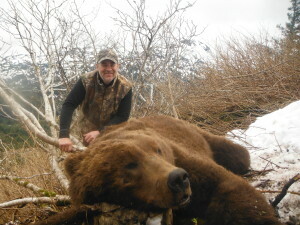 Finally, on the last day, Davis connected on a big cow, and put some very good meat in the freezer. In all 3 hunts I was once again reminded of the value of physical conditioning and persistence when it comes to hunting. It is easy to get frustrated when things are not working out, but hunting has a way of turning around very quickly, and it seems more rewarding to finally connect on the last day of a difficult hunt. Thanks for reading and enjoy the pictures!